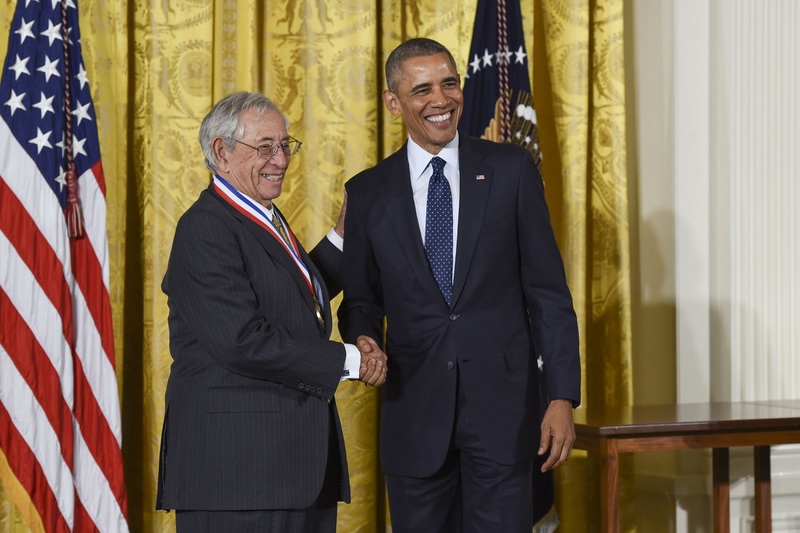 On Thursday, May 19, President Barack Obama awarded University of Maryland Physics alumnus and Fischell Department of Bioengineering (BioE) namesake Robert E. Fischell the National Medal of Technology and Innovation (NMTI). This award marks the highest honor for technological achievement bestowed by the president of the United States. "As President, I'm proud to honor each of you for your contributions to our nations," Obama told this year's NMTI and National Medal of Science recipients. "As an American, I’m proud of everything that you’ve done to contribute to that fearless spirit of innovation that’s made us who we are, and that doesn't just benefit our citizens but benefits the world." Fischell was just one of eight individuals awarded the National Medal of Technology and Innovation this year. Full video of the 2016 awards ceremony is available online. Fischell (M.S. ’53, Hon. Sc.D. ’96) is known for inventing life-saving medical devices, and pioneering the modern era of space satellites. He holds more than 200 patents, including nearly 30 patents on orbiting spacecraft. In the medical device realm, Fischell has served as a leading contributor to the invention of coronary stents, the implantable heart defibrillator, the implantable insulin pump, a device to prevent migraine headaches, and a device to prevent death from heart attacks. A native of New York City, Fischell first earned a degree in mechanical engineering at Duke University before relocating to Maryland to work at the U.S. Naval Ordnance Lab and, later, the Johns Hopkins Applied Physics Laboratory. In 1953, Fischell earned a master’s degree in physics at the University of Maryland, and in 1996, the university awarded him an honorary doctorate. Fischell is an active member of the University of Maryland community, serving on both the A. James Clark School of Engineering Board of Visitors and the University of Maryland, College Park Foundation Board of Trustees. As a distinguished benefactor of the Clark School, Fischell’s support helped establish the Fischell Department of Bioengineering (BioE) in 2006 and Robert E. Fischell Institute for Biomedical Devices, which will be inaugurated in 2016. Both will be headquartered in the new A. James Clark Hall in 2017. To date, Fischell continues to educate aspiring bioengineers in his role as BioE professor of practice. “Bob is a truly inspiring individual. Our department and college are filled with students, faculty, and staff who are inspired by his energy, drive, and inventive creativity to develop transformative technologies that improve human health,” said William E. Bentley, Robert E. Fischell Distinguished Professor of Engineering and founding Chair of the Fischell Department of Bioengineering. Immediately following the White House awards ceremony, Fischell spoke with ABC News Online and the Baltimore Sun about his life as an innovator. The National Medal of Technology and Innovation is awarded annually to individuals, teams, companies or divisions of companies for their outstanding contributions to America’s economic, environmental, and social well-being. 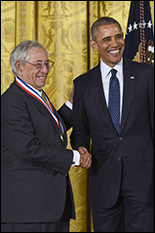 The purpose of the National Medal of Technology and Innovation is to recognize those who have made lasting contributions to America’s competitiveness, standard of living, and quality of life through technology innovation, and to recognize those who have made substantial contributions to strengthening the nation's technological workforce. As a recipient of the National Medal of Technology and Innovation, Fischell joins the likes of Steven Jobs and Stephen Wozniak (Apple Computer, Inc.), Stephen D. Bechtel, Jr. (Bechtel Group, Inc.), David Packard (Hewlett-Packard Company), Clarence L. Johnson (Lockheed Corporation), Edwin H. Land (Polaroid Corporation), and Edith Flanigen (Union Carbide). Established by the Stevenson-Wydler Technology Innovation Act of 1980, the medal was first awarded in 1985, and is administered for the White House by the U.S. Department of Commerce’s Patent and Trademark Office. Fischell and other recipients of the National Medal of Technology and Innovation will receive their medals at a White House ceremony. Fischell is a member of the National Academy of Engineering, and is the recipient of many major honors, including the Inventor of the Year for the United States in 1983, induction into the Space Technology Hall of Fame and the Clark School’s Innovation Hall of Fame and an honorary Doctorate for Humane letters from the Johns Hopkins University in 2008.